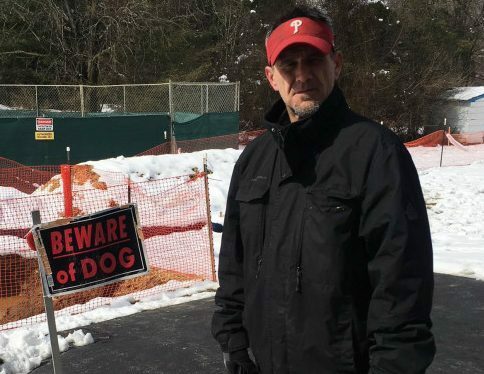 PHOTO BY JON HURDLE, T.J. Allen, a resident of West Whiteland Township in Chester County, stands in front of sinkhole enclosures in his back yard. Allen said he's worried about the sinkholes, and the fact that Sunoco has been ordered to make sure an existing pipeline that runs through his neighborhood is safe. Sunoco scrambled to inspect an aging pipeline on Friday in the backyards of Chester County homes where drilling for two new pipelines has caused several sinkholes to open up. Yellow backhoes dug holes in several places among homes along Lisa Drive and Lynetree Drive in West Whiteland Township after the Pennsylvania Public Utility Commission ordered Sunoco to temporarily halt operations of the Mariner East 1 pipeline. The PUC cited the risk of what it called “catastrophic results” if the pipeline leaks any of its natural gas liquids.